Is Japanese Tea Safe to Drink? Is Japanese Tea Safe from Radiation? And the reason why is multi-faceted. Firstly, by “safe to drink”, the layman might think this means, “the tea is absent from radioactive particles”. While this may be true for many producers, this interpretation isn’t entirely accurate, for reasons that will soon become apparent. Why shouldn’t you be worried? Thankfully, radiation doesn’t travel far unless carried by a radioactive material, and the tea growing regions of Japan are a significant distance from Fukushima. The distance from Fukushima to Shizuoka Prefecture, where 40% of all Japanese tea is grown, is 360 km (224 miles), or just a bit further than the distance from New York City to Washington D.C. Another 30% is grown on a completely different island, Kyushu, where you have the infamous tea growing Prefectures Fukuoka and Kagoshima, the latter of which is as far away from Fukushima as New York City is from Atlanta. It’s worth noting that the exclusion zone around the power plant is only 30 km (18 miles), and over the last five and a half years, the Japanese government has been systematically removing a layer of topsoil, significantly reducing the ambient background radiation. Before Fukushima, Japan allowed food exports to register under 500 Bq / Kg, the same limit as the European Union. After the disaster, Japan reformed their rules to only allow 100 Bq / Kg, the lowest range of any country on Earth. You might be wondering, as a means of comparison, how much does the USA allow in our imports? Even though Canada and the International Codex allow a maximum of 1000 Bq / Kg, the United States tops the list with a maximum of 1200 Bq / Kg, or 12 times Japan’s standard! Though this seems high (by comparison), we are far from negligent in our duties. The FDA has worked on this issue extensively, coordinating with Japan’s Ministry of Health, Labour, and Welfare (MHLW), and issues reminders to the public that it has found no cause for concern among any imported foods from Japan and that the import standards are considered safe. They also consult the EPA’s environmental radiation monitoring program (RadNet), and the International Atomic Energy Agency (IAEA), who keep a fairly regular (weekly to bi-weekly) journal of what’s happening in Japan. Provided these organizations are doing their jobs, many tea companies have taken up the mantle of preventative concern themselves. For instance, Aiya, a huge Japanese brand primarily selling matcha, releases monthly reports of radiation testing conducted on their tea, a process that certainly doesn’t come cheap. Numerous other brands do this, and are very open about the testing. Resources are available online to research what levels of radiation are being reported in Japanese foodstuffs and tea, either from governmental bodies or from the tea distributors themselves. If you’re concerned, simply ask! Finally, there’s the idea of “safe” when it comes to radiation. All of these numbers and concepts can be abstract, so I’d like to provide context. Then, let’s say you drink three cups of tea a day for a whole year, using an average of 4 grams of tea per cup. This translates to 12 grams of tea, or 1.2 Bq, per day. Taking all these factors into consideration, what would be the total amount of radiation you would ingest over the course of a year? * Yes, bananas are radioactive, because about 0.0117% of natural potassium is radioactive, thus any foodstuff with potassium, including avocados, potatoes, beans, and yes, coffee (don’t get too excited tea people), are radioactive. The simple and unavoidable fact of life is this: we’re all exposed to radiation constantly. It’s a natural part of this planet. It’s everywhere, bombarding us from space, radiating from the building materials of our homes, from minerals in the soil, and in the air we breathe. This is called background radiation. Ever been in a hot spring? Been near a brick or cement building? Flown in an airplane? Been to the dentist? Then you’ve been exposed to multiple forms of radioactive materials. The average human on this planet racks up about 2 to 4 mSv of background radiation a year (and in some places this can be as high as 10 mSv). The experiment detailed above, an exaggerated worst-case scenario, would be effectively the same as walking around the Colorado Plateau for a day or two. 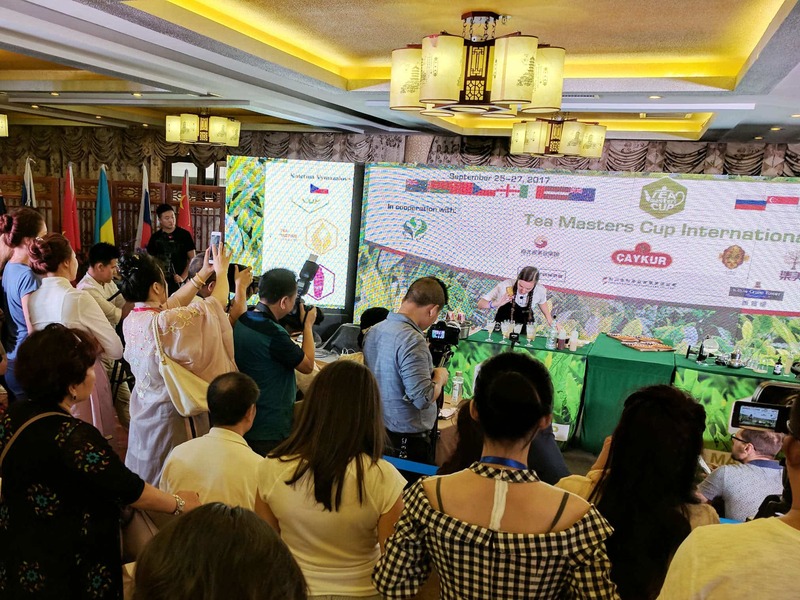 Japan and their tea producers took the necessary, often extreme precautions, in coordination with multiple organizations at home and abroad, to make sure their tea was safe for you and me. Radiation is everywhere and the amount you could possibly get from drinking tea is minuscule. So stop worrying about it and go enjoy a cup! Jordan has spent most of his life working in the food and beverage industry. His professional experience with tea started at American Tea Room in Los Angeles, where he worked for almost six years, becoming their Beverage Director and helping in a three-location expansion. Later, he moved to developing, training, and menu-building what would become Alfred Tea Room, which he's helped expand into Japan. He now serves as Food & Beverage Director for Alfred Inc. which includes Alfred Tea Room and multiple locations of Alfred Coffee in Los Angeles and Austin. I have a hard time grappling with your claim that the article is “utter bs from a scientific human health perspective”. That claim is demonstrably not true. Please refer to the numerous references I cited above, including ones from the FDA, EPA, MIT, World Nuclear Association, New York Times, IAEA, and MHLW. The intent here is to reassure people that not only is it totally fine to drink Japanese tea (and once again, you can get the actual reports from plenty of companies even if you are still worried), but that’s it’s the overwhelming consensus opinion of the scientific community. A nicely written article, however, all the article really does is assure people that if the drink tea exported from Japan that is under 100 Bq / Kg they have absolutely nothing to worry about. But that isn’t the concern tea drinkers have when it comes to drinking tea from Japan. The concern is whether or not exporters of Japanese tea are being honest and following the required guidelines of only exporting tea under 100 Bq / Kg? And is anyone really monitoring this? If so, who, how often, what is their agenda etc.? The truth is one is taking their chances drinking tea from Japan, even tea grown in Fukuoka since how do you know they are not getting cheap fertilizer from Fukushima prefecture? To be safe, best to avoid Japanese tea. Not worth the risk. Too bad. I understand your concern, but I can’t really agree with what you’re getting at. You ask, “is anyone really monitoring this?” The answer, as stated in the article above, is yes. Both the Japanese (MHLW) and American (FDA) have agencies that monitor these things. You also ask, “What is their agenda?” Well, I don’t know besides their stated goals and missions but I think it’s highly unlikely that their intention is to dose the world with radiation. We have to remember that whatever we’re worried about over here, the Japanese are worried about 100-fold considering they live and breathe air, food, and drink processed in and around the site. Finally, you say that the “truth is one is taking their chances drinking tea from Japan.” As I tried to explain in the article above, this is demonstrably false. According to many news sources, not a single person died or has died from radiation outside of the Fukushima Plant itself. And even, as stated in my worst-case-scenario above, you were drinking irradiated tea, it would be less radiation than the average American consumes in bananas per year. Or, equivalent to walking around in the sun. The amounts we are talking about are incredibly negligible. The hype around the perceived dangers of radiation are overblown in my opinion, and I, as a result, still drink copious amounts of Japanese tea. Great article, Jordan. Good read. I am wondering though, you mentioned two places in Japan where 40% and 30% of all Japanese tea is grown. So what about the remainder of 30%, where does that grow and do they sell that tea internationally? And let’s not forget places where tea goes through a process, which is in some cases not where the tea itself is grown. Another question. Why do tea sellers outside of Japan test the tea themselves in laboratories if the maximum legal export limit in Japan is 100 Bq / Kilo? Hey Rone! Pretty much every Japanese prefecture southwest of Shizuoka grows some amount of tea, and those added up account for the remaining 30%. Only one or two prefectures north of Shizuoka, and thus closer to the exclusion zone, grow tea and it accounts for a very very small percentage. The tea growing in the first 70% that I mentioned probably account for a larger percentage of export, as it’s fairly rare to see tea from Okayama, say. As for processing, once again, the bulk of that happens in the same prefectures as the growing. As for retailers of Japanese tea, I’d say the biggest reason they get their tea tested is for their customer’s peace of mind. Even with a country as balanced as Japan, a general lack of trust and fear of negligence in governmental bodies prevails and customers simply don’t think everyone is being honest. There have definitely been reported cases where shipments higher than the legal limit have been exported and later found to be higher, and this might be due to how they screen for these things. Generally, with exports and imports, not every single shipment of every single product is tested, but a randomized selection to give you a general overview. Thus, things can slip by. But the facts are there, and the actual danger is negligible, as my article explains. This definitely answers my questions. Thank you! Good to know that Japanese tea is safe to drink. This article was very informative. I never realized that there is radiation in natural potassium! Do you by any chance know how much radiation we can consume before it starts harshly effecting us?